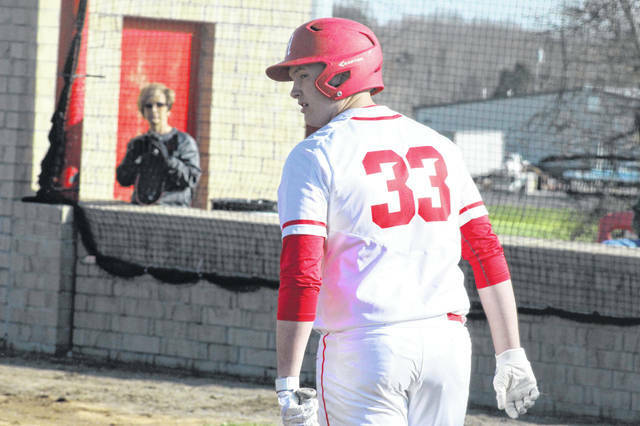 Minford senior Ethan Lauder drove in three runs in the Falcons win over SOC II foe Northwest Monday evening. Minford (10-0, 6-0 SOC II) continued their undefeated start Monday with a win over SOC II foe Northwest (1-8, 0-6 SOC II), 13-0. After his walk off single Saturday vs. Athens, Reid Shultz picked right up where he left off Monday by going 2/2 with three RBI. Ethan Lauder, Luke Lindamood, and Nathan McCormick all combined for six hits and six RBI in the Falcons win Tuesday. At the mound, Matthew Risner and Levi Coriell combined for a two hit performance in five innings of work with seven combined strikeouts. The South Webster Jeeps (3-9, 3-4 SOC II) picked up their third SOC II win and third overall win in 2019 Monday with a narrow 9-8 decision over conference foe Valley (3-7, 1-5 SOC II). At two different points in Monday’s game, South Webster trailed Valley 5-0 and 7-2. But thanks to big a two RBI single from Riley Cook which tied the game at 7-7 and a two RBI double from Billy Jones, South Webster took the lead at 9-7 in the latter stages Monday before ultimately holding on 9-8. Brice Robnett and Caleb Cunningham each picked up an RBI single in Monday’s win, Gabe Ruth finished 1/2 with two runs scored while his brother Jacob Ruth finished with and RBI double and two runs scored. On the mound, Cunningham picked up the win for the Jeeps. He went for 2.2 IP while allowing just one run on three hits. In the bottom of the seventh, Cam Carpenter entered with one out and the tying run on base. Carpenter proceeded to retire the two batters he faced and seal the come from behind win for the Jeeps. For Valley, Jesse Jones led the Indians by going 3/3 at the plate with a game high three RBI. Clay (9-1, 4-0 SOC I) continued their fast start with a 14-1 win over East (0-9, 0-6 SOC I) in the final game of their season series. Shaden Malone and Jaden Jesse combined for a no-hit effort in Monday’s win over East with a combined nine strikeouts. At the plate, Reece Whitley finished 2/3 with two RBI while Dakota Dodds finished 2/4 with two RBI as well while Evan Woods finished 2/4 at the plate. South Webster (11-4, 5-1 SOC II) picked up another SOC II win Monday at Valley (0-8, 0-6 SOC II) by a score of 18-0. Rylee McGraw earned the win by pitching in four of the five innings, allowing just one hit and striking out three Indians batters. From the plate, Emma Bailey led the Jeeps by going 2/4 at the plate with a game high four RBI while McGraw and Bri Smith each drove in three runs on a combined five hits. Portsmouth West (2-8, 1-5 SOC II) fell in SOC II play Monday to Waverly, 14-2. Morgan Rigsby finished 2/3 at the plate and drove in the Senators lone RBI in the loss. Clay (10-0, 6-0 SOC I) picked up an SOC I win over East (2-9, 0-6 SOC I) Monday, 18-0. Preslee Lutz took to the mound Monday for the Panthers pitching a complete game with nine strikeouts and just three hits allowed. At the plate, Lutz finished 4/4 with four RBI in Monday’s win. Fellow Panther Cassidy Wells hit her second home run of the season in the second inning while scoring four runs herself and knocking in two RBI. Shaley Munion also had a big game at the plate by going 3/3 with two triples and a team high five RBI. Elisa Collins also made big contributions for Clay by going 2/2 with a double and a triple being her lone two hits while also driving in two RBI. Sierra Lyons, Sydnee O’Connor, and Kaci Bell each picked up a hit in the Tartans loss Monday. Notre Dame (10-0, 6-0 SOC I) continued its’ unbeaten start in 2019 with an 11-1 win over Notre Dame Monday. Ace Cassie Schaefer pitched a complete game one hitter while walking just one batter and striking out eight. At the plate, Claire Dettwiller led the way for the Titans by going 2/2 with two walks and three RBI in her four plate appearances. Maddy Suter and Chloi Hayslip each picked up a hit and two RBI in the Titans win over Green Monday. Gracie Daniels picked up the lone hit for the Bobcats in their loss to Notre Dame. New Boston (2-8, 1-4 SOC I) picked up its’ second win overall and first SOC I win in 2019 with a road win over Western in Latham, 18-3. Junior Taylan Hickman pitched a complete game in the Tigers win while allowing just three hits and striking out ten batters. At the plate, Lexus Oiler led the Tigers by going 5/5 in her five plate appearances with three RBI and one home run. Hickman also contributed at the plate by going 3/5 with two RBI. Sammy Oiler finished 3/5 at the plate with three RBI while Ashley Stone finished 1/4 with two RBI.